Update on Alice: Alice has found a wonderful home, but we'll be paying off her medical bills for awhile. We have raised about $300 towards her medical bill, which exceeds $3000, so we're going to leave her page up for a bit so that we can continue raising the funds to help with her medical bills. 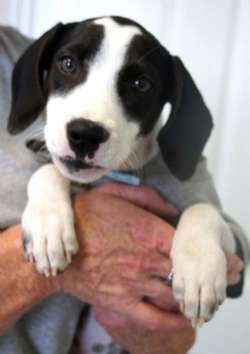 Here's her original description: Alice is a 3 month old female Beagle "blend" of a pup who came up from TN to be adopted. She is in a vet hospital right now as she became very ill following her second set of vaccines. Her medical bills have exceeded $3,000 so any help we can get for her would be much appreciated. We already have an adopter waiting to bring her home once she is well. Thank you very much! Amber is a Golden Retriever mix puppy who is pure LOVE!!! Amber, Breeze, Katrina, Rocket, Shasta, and Vanna are gorgeous Golden Retriever mix pups. They are 4-5 months and they have the most amazing eyes. 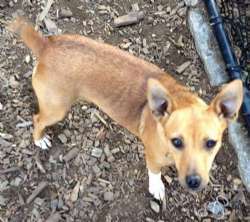 Amber has loves attention and weighs approximately 15 lbs. These beautiful pups are soon ready to be adopted. They crave attention as they have had to compete with each other their whole lives so far and are each ready for their own families. They would do best with someone who can spend as much time with them as possible and start the training they need. They have discovered air conditioning indoors lately and now they want to stay in all the time. they are submissive with other dogs and young enough to be trained around cats. Please help our Adoption team by filling out the online application so that we can have it ready when you come to one of our weekend Meet and Greets, I.e., shelter hours. We are looking for stay-at-home adopters only! Experienced dog owners who have been through obedience training are a must! Amber, Breeze, Katrina, Rocket, Shasta, and Vanna are gorgeous Golden Retriever mix pups. They are 4-5 months and they have the most amazing eyes. Breeze is a small black female, weighing 19 lbs. These beautiful pups are soon ready to be adopted. They crave attention as they have had to compete with each other their whole lives so far and are each ready for their own families. They would do best with someone who can spend as much time with them as possible and start the training they need. They have discovered air conditioning indoors lately and now they want to stay in all the time. 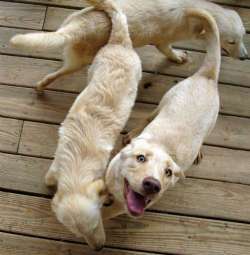 they are submissive with other dogs and young enough to be trained around cats. Please help our Adoption team by filling out the online application so that we can have it ready when you come to one of our weekend Meet and Greets, I.e., shelter hours. We are looking for stay-at-home adopters only! Experienced dog owners who have been through obedience training are a must! Buttons is a sweet, wonderful, loving, gentle little dog who does tricks. She is around 1 year old and weighs 25 lbs. She is completely house trained. She will follow you from room to room like a little shadow. She loves attention. Sleeps in all night, uses the dog door to go outside. 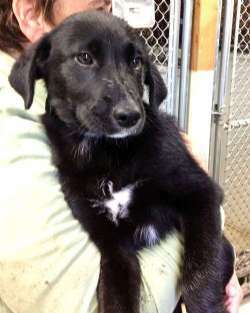 She was fostered in TN with 10 other dogs including 9 wk. old puppies and she was fine with all of them and is good with cats. She walks on a leash and rides well in the car. Buttons has a little trick, she sits up on her haunches and paws the air with both paws to get food or sometimes your attention. It is very cute. She also catches treats in her mouth. Buttons' foster mom says she is the most perfect little dog in the whole world. She looks big in the picture but is barely 25 lbs. She is available now, but is in a foster home, so please fill out the application and then let us know if you are coming to meet her. Camilla is 3 month old Collie mix. She is Charles's sister and also sister to Harry and William. Camilla is a sweet girl that needs a gentle hand to keep her going in the right direction. She loves to be pet and clan be a real cuddle bug. Camilla uses the dog door and is house broken. She has just learned to walk on a leash still need a little coaxing. Treats help! She loves her toys and loves to run around after her brothers. If you are interested, please apply via our online application so that we have it ready when you meet her during our next visitation hours. She arrives from TN on 9/19 and will be available 9/22. These pups need homes where someone is home during the day, not someone just coming home for lunch as they need to play and be socialized. Life in a crate would be very hard on a pup. Please apply if you can offer a great home! Our application is online and is easy to fill out. Charles is a 3 month old sweet little boy who came with his sister Camilla and also brother to Harry and William. He loves to be pet, will climb in your lap, and follow you around staring waiting to be picked up. 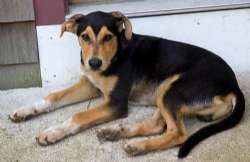 He seems to be housebroken but is still young and will need some encouragement and guidance. He has just learned to walk on a leash and is very proud of himself. Since he is a young puppy a fenced in yard is required. If you are interested, please apply via our online application so that we have it ready when you meet them at a Meet and Greet. He arrives from TN on 9/19 and will be available 9/22. Copper is a beautiful copper colored puppy. He was an owner surrender when his owner ended up with 8 puppies from 2 litters at once. He is brother to some of the retriever pups that were just there. Cooper is housebroken, and knows how to use a dog door. He walks on a leash, and loves to play with his brother and other dogs. He is very submissive to the older dogs and just wants to play. He does not jump up, takes food gently, and really just wants to be loved and pet all the time. Copper is a little shy at first but comes around quickly with gentle guidance. He is brother to some of the retriever pups that were just there. If you already have an application on file, we can apply your application to Copper. We require stay-at-home situations for these pups. It's not enough to come home for lunch. If do not already have an application on file with us, please apply via our online application so that we have it ready when you meet him at a Meet and Greet. 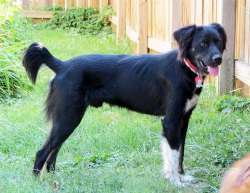 Dusty is a nice 2 year old neutered male Border Collie / Spaniel mix with an Australian Shepherd naturally bobbed tail. He is full grown at 50 lbs. Dusty is an absolute love, and likes to lay his head in your lap or under your arm and just loves attention. He's not a dog to sit at home while you're at work, but would be better off with older kids (tweens) to play with him. He has the herding instincts so would probably herd small children. He's still going through the chewing stage so needs bones to chew on or he will choose shoes. He hasn't been exposed to cats very much. His history is sad: he showed up in a WV neighborhood in June and was drawn to children playing so they brought him home and he was then brought to a dog rescuer. His coat was in bad shape from lack of care and so he was treated for demodectic mange. He's recovered now. He was put on a grain-free food and supplements and he did great on them. He has a ravenous appetite so is not a "grazer" when it comes to food. He loves other dogs and has many playmates. He just does not like to share his food with them. Please apply if you're interested in meeting him. He is available NOW. Earl is a 24 lb. sweetheart with gorgeous eyes. He is very gentle, and walks well on a leash. Earl is very happy. He loves everyone and everything. He is half brother to Copper and to the other Golden Retriever mix puppies that are here at Save a Dog. He looks like he has some Dobie in him. Earl, like his siblings, craves attention as they have had to compete with each other their whole lives so far. All the pups are now each ready for their own families. They would do best with someone who can spend as much time with them as possible and start the training they need. They have discovered air conditioning indoors lately and now they want to stay in all the time. They are submissive with other dogs and young enough to be trained around cats. We are looking for stay-at-home adopters only! Experienced dog owners who have been through obedience training are a must! Please help our Adoption team by filling out the online application so that we can have it ready when you come to one of our weekend Meet and Greets, I.e., shelter hours. We are looking for primarily stay-at-home or part time working adopters! Harry and his brother, William, are 13 week old puppies who came up from TN in search of a good home. They need stay-at-home situations where they can be properly socialized, loved, and trained. Please fill out our online application if you are interested in meeting either pup. 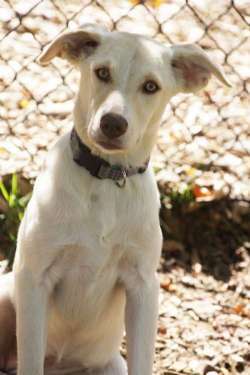 Haven is a sweet, loving, and gentle 9 month old Collie/Basenji mix who is the perfect family dog. He is 9 months old and weighs 19 lbs. He is a handsome guy with tuxedo markings, curled up tail and silky short-haired coat. He is completely house trained. He’s happy to sleep on a pad at night but wants to be near you. He will wake you up to go outside in the morning. He walks well on a leash, knows how to sit and stay, and loves riding in the car. He’s been in a home with dogs of all sizes/ages and a cat that rules the roost and he’s great with all of them. Haven’s foster parents say he is a very special boy that deserves a forever home. He had it rough as a puppy, abandoned on the streets to fend for himself. Starved and dehydrated, he collapsed at the foster parents’ doorstep. But that’s the past and now he’s appreciating the finer things in life - good food and chews and lots of toys. One thing he’s missing is a home to call his own. This little guy wants to be at the heart of a family. 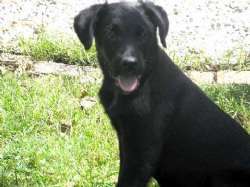 He loves to play and play, is basically indestructible, and has a marvelous temperament. Amber, Breeze, Katrina, Rocket, Shasta, and Vanna are gorgeous Golden Retriever mix pups. They are 4-5 months and they have the most amazing eyes. Katrina is the largest female, at 30 lbs and is a total clown. She loves to steal toys from the other dogs and run around laughing. She's such a card! These beautiful pups are soon ready to be adopted. They crave attention as they have had to compete with each other their whole lives so far and are each ready for their own families. They would do best with someone who can spend as much time with them as possible and start the training they need. They have discovered air conditioning indoors lately and now they want to stay in all the time. they are submissive with other dogs and young enough to be trained around cats. Please help our Adoption team by filling out the online application so that we can have it ready when you come to one of our weekend Meet and Greets, I.e., shelter hours. We are looking for stay-at-home adopters only. Experienced dog owners who have been through obedience training are preferable. 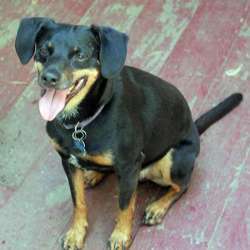 Little Sam is a very handsome 20 pound, 6 year old miniature pinscher/dachshund mix who is looking for a new home because he is nervous with the toddler in his current home. He has a lot to offer and would make a great dog for any number of homes. He LOVES car rides, so could go on your errands with you. He loves to go for walks and would make someone a great little running partner! He also would love to snuggle up on your lap or right up against you under a blanket in the evening. Sam is housebroken and crate-trained; if you say "go to your room" he runs right into his crate! He knows the basic commands sit, stay, down, come and shake. He is currently living with a toddler but is very fearful of him and needs a new home where he is able to relax. Sam was diagnosed with focal seizures in November 2009, sees a neurologist once each year and takes phenobarbital twice each day. He has not had a seizure since beginning the meds, and they are very inexpensive ($10-15/month). He enjoys taking them with a bit of peanut butter. Sam is playful, happy, goofy and loves to play with doggie toys. He gets along well with other dogs but would probably chase cats. He is a sweetheart who would make a wonderful companion to a couple or family with older children, and would love nothing more than to be the apple of your eye! Sam is healthy, UTD on shots and neutered. Please apply online so we can be in touch with you. Little Sam is not at the shelter so would need to be brought here for you to meet him. 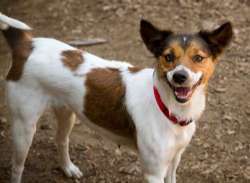 Lola is a wonderful little 2 yr. old Jack Russell mix who will make someone a great little companion. She is very quiet, and does not bark a lot. Lola loves going for walks, riding in the car, playing with all the other dog. She is a cuddle bug - loves to sleep in your bed and sit in your lap. Lola is house broken and crate trained. 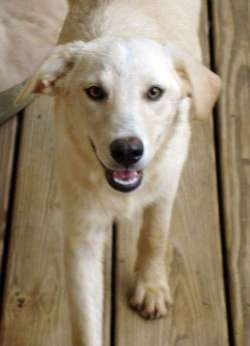 Lola is spayed and up to date on her vaccines, and is waiting to be loved in her own home! She's tiny even though her pictures make her look larger. She's probably 12# or so. Lola is great with cats; she would even play with her foster moms 5 month old kitten, and she played with the puppies too. If you are interested, please apply via our online application so that we have it ready when you meet her at a Meet and Greet. Minnie is a sweet 4 month old Terrier/Schnauzer mix who is available for adoption. She is shy and quiet and generally submissive, but does jump up for attention. She loves to be petted. She came in with her sister, Daisy. Both are really sweet pups. Please fill out an application if you are interested in her so we can have it ready when you come in to visit. Meet/Greet hours are on the Web site. 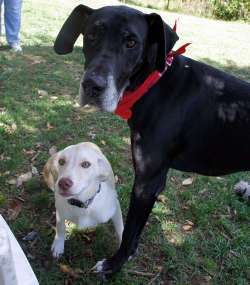 Nikka is a a beautiful and gentle 110 pound Great Dane who is 3 years old. She is a great companion and currently is approved to attend classes at U Mass where her animal behaviorist foster mom is attending. She loves to ride in cars and will jump in and lay down for the ride. Nikka loves to go for walks and she does pretty good, but does pull on the leash some. Nikka is very gentle, loves people, and will follow you from room to room. Nikka loves to lope almost every where she goes and takes it is breathtaking to watch her run. Nikka wants to play with other dogs but doesn't realize her own size so she should have supervised play when with puppies, her favorite pals. Her former owner would like to see Nikka get a home in the country where she can run her heart out. She sleeps in every night and she has not torn anything up, or had any accidents. She is a surrender due to a divorce situation. Her owner tried to keep her, but after bouncing her around a few times and her being locked in a small pen at his parents house, her owner realized letting her go to a good home was the best thing for Nikka. When her 27 year old owner dropped Nikka off at our fosters' home, he was crying as he left his dog behind. He would cry tears of joy if he could see her fostered with one of our volunteers who is a college student majoring in Animal Behavior as Nikka gets to attend all her classes. Please apply online if you are interested in meeting her. She is available. Meet Patches. 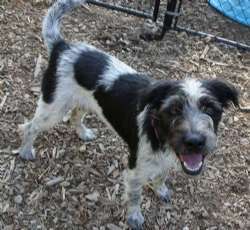 He is a nice young Wire-hair Terrier mix looking for a new home. He is a GREAT dog who loves to play. 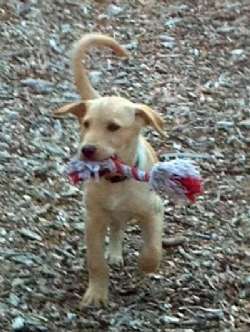 You can see a video of him playing with Pearl on our pet finder site. He would be great fun to take to the dog park. He's not for apartment living as he's a country bumpkin who is used to easy access to the outside. He is neutered and up to date on core vaccines. He weighs 35 lbs. He has lived with three cats and a senior dog as well as his sister, Lucy. He takes treats gently and rides well in the car too. His foster mom says: Most Happy Fella are the best words to describe Patches. He loves soft toys and keeps busy moving them around, inside and out. But mostly he loves his people. He's always at your side, but not demanding attention, just shadowing. When you are sitting, he's sleeping nearby. He especially loves sports on TV because for hours he gets a lap to rest his head on and nice long belly rubs. He also loves playing with his dog friends. Patches is totally housebroken. He is crate trained, but doesn't love it because wants to be with his people. He will settle down in the crate after a few minutes. He's learning that not all furniture is for dogs, just the TV couch. He's always up for a walk. He pulls a little on the leash and is on the lookout for squirrels, but his foster mom and dad are seniors and don't keep his brisk pace. The slight pulling is easily corrected with standard obedience training. On a walk recently, we met kids on scooters and bikes and he shied away, perhaps because he hasn't had experience with kids. Otherwise, all in all, Patches is a really nice, fun and oh-such-a-love dog! Please apply online to speed the process if you can. You can meet him by private appointment as he is in a foster home. 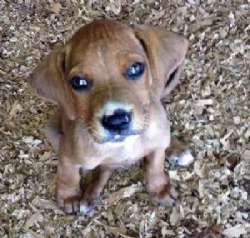 Peanut is a tiny 3 month old male Beagle "blend" of a pup who is available for adoption.He is much smaller than he looks in his picture. He is extremely sweet and submissive. We had a lot of applications for him, but nobody has actually come to see him yet, so if you fill out your application, we will get right back to you. Please apply online if you'd like to meet her when he's available. Pearl is a GEM of a dog! 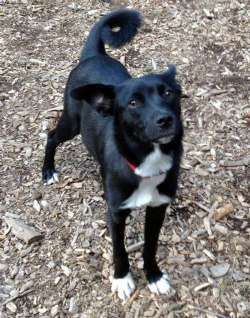 She's a year or so old, spayed female Australian Shepherd / Border Collie mix. Just a hint of a tail, She looks like a black Australian Shepherd. She loves to run around with a Frisbee in her mouth and she is very agile if agility is your thing. She can calm herself right down, though, and is not one of those very driven herders. 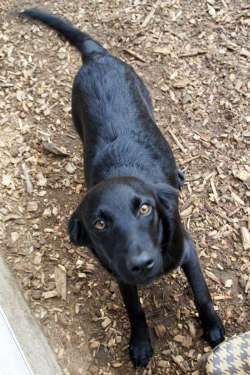 She plays nice with other dogs and really craves the play dates, so another dog would be a lot of fun for her. She is a really submissive dog who is a sweetheart in a nice medium size. Her story: Can you believe she was a stray? Now way, we said. Yup, found in TN and was picked up by animal control. She walks very well on her leash and gets along with foster Mom's German Shepherd. She has not been cat tested but when walking looks at them and wants to chase, common for her breed. She loves people and really just wants love. She is available now. 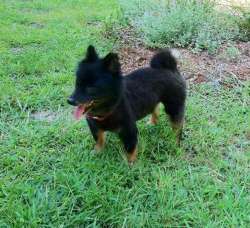 Pierre is a little Pom who is AMAZINGLY cute and is an EASY dog and he has that Pom PRANCE that is so cute. Right now he looks like a little Bear Cub because he just got groomed and his coat is short. This little guy has a lot going for him. He loves the car and loves to take walks on leash. He is very smart and will redirect when told no. He also loves his crate and will head for any crate with an open door and go in and hang out. He gets along with all types of dogs. He loves toys and balls and he loves kids. What a cutie - if he finds a crate in a room he goes in it and takes a nap.He does not bark, LOVES to play with other dogs and has gotten used to his fosters cat. He loves some raw food in his diet. He doesn't like to be groomed and if he sees the brush coming he will run the other way. We think this was because he had a bad experience at the groomers when he had mats. He will need a soft touch for grooming and someone to work on desensitizing him as he will need to be groomed from time to time. Pierre is in a foster home and is available by private appointment once we receive your application. 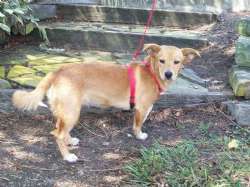 Pup Pup is an adorable little mixed breed dog who resembles a Corgi/Golden Retriever. This little dog had been lost and adopted by a couple who were in the process of moving and couldn't keep her. She's really sweet, plays ball with their son and is an all around happy girl. She looks to be a mix of Corgi and Golden Retriever. She was with a humane society that we work with in WV and they had spayed and vaccinated her. She loves to chew on raw bones and to chase balls. She doesn't know how to bring them back yet, but that's a no-brainer to teach. She is curious about cats but if they don't run, she won't chase. She's learning crate training and prefers a harness to a collar. When you open the door, tell her "Back" and she will stop and usually sit down. She likes chew hooves and raw meat. She doesn't know to take it gently, though. She is too much for a senior dog as she was fostered with them and she was "too much' for them. She's a real cutie and will be arriving on 8/22/2012. She will be available after 8/24. Please apply online if you're interested in her. Amber, Breeze, Katrina, Rocket, Shasta, and Vanna are gorgeous Golden Retriever mix pups. They are 4-5 months and they have the most amazing eyes. Rocket loves attention and weighs approximately 17 lbs. These beautiful pups are soon ready to be adopted. They crave attention as they have had to compete with each other their whole lives so far and are each ready for their own families. They would do best with someone who can spend as much time with them as possible and start the training they need. They have discovered air conditioning indoors lately and now they want to stay in all the time. 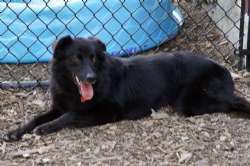 they are submissive with other dogs and young enough to be trained around cats. Please help our Adoption team by filling out the online application so that we can have it ready when you come to one of our weekend Meet and Greets, I.e., shelter hours. We are looking for stay-at-home adopters only and preferably experienced dog owners who have been through obedience training. Amber, Breeze, Katrina, Rocket, Shasta, and Vanna are gorgeous Golden Retriever mix pups. They are 4-5 months and they have the most amazing eyes. Shasta is the smallest female and needs to go to a quiet home where she can get 4 little meals a day to help put some weight on her as she is the thinnest. These beautiful pups are soon ready to be adopted. They crave attention as they have had to compete with each other their whole lives so far and are each ready for their own families. They would do best with someone who can spend as much time with them as possible and start the training they need. They have discovered air conditioning indoors lately and now they want to stay in all the time. they are submissive with other dogs and young enough to be trained around cats. Please help our Adoption team by filling out the online application so that we can have it ready when you come to one of our weekend Meet and Greets, I.e., shelter hours. We are looking for stay-at-home adopters only! Experienced dog owners who have been through obedience training are a must! 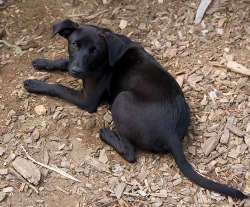 Sheba is a 5 month old pup who was born to a purebred German Shepherd on March 13, 2012. Dad is unknown, but possibly Golden Retriever. We placed mama, Bella, and her siblings (Cassie, Lexie, and Rexy) in May, but Harley and Sheba stayed back with the foster mom in WV because she was very attached to them, but circumstances changed and they are now with us . They have been in home (never in a shelter) and know how to sit, but will need additional obedience training. Sheba reminded foster mom of Queen of Sheba when she was small with her blue eyes outlined in black. Looked like she had on eyeliner and still does. Her eyes have turned a light amber. She has the personality of her Mother Bella. She is very sweet and wants constant attention. She will scoot on the floor and then roll over to have her belly rubbed -- she loves belly rubs. She is a gentle soul who will do best with a gentle, positive, reward-based training. They are beautiful dogs and will make someone loving pets. She is available on/after 8/25. Summer is a sweet little Beagle mix female puppy. She is tiny and so adorable. Her feet have barely touched the ground since her arrival as all the volunteers insist on carrying her around. She is so yummy, you could eat her up. Summer was rescued when she was brought in because her owners abandoned her in an empty apartment when they moved away. Summer would really love to be part of someone's life. She wants to be held, cuddle with you. She will follow you around staring at you until you pick her up. She is housebroken and knows how to use a dog door to go out. 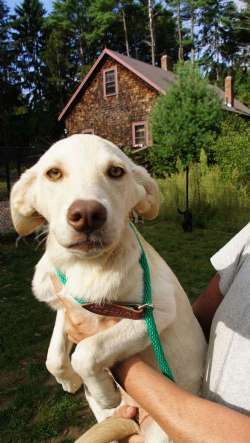 Summer has just learned to walk on a leash, and loves taking walks.She is waiting for her forever home! We require stay-at-home situations for these pups. It's not enough to come home for lunch. If you are interested, please apply via our online application so that we have it ready when you meet her at a Meet and Greet. 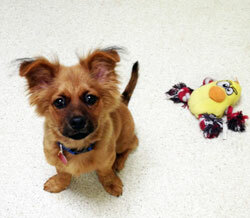 Teddy is an adorable 4-month-old puppy who is looking for his family to love forever. He's already housebroken and with a fenced in yard, he will do his business the furthest away from your house. Our best guess is that he is possibly a Tibetan Spaniel with crimped hair like a Golden and feet like a Corgi. He's a cute little Mutt. He has a touch of black on his tongue, so people may think he has a touch of Chow, but 44 breeds have black spots on their tongue, including Golden Retrievers. Teddy is the cutest pup with the fluffiest ears and the softest fur. He is a really smart pup and doesn't miss a trick. It's hard to believe he was ever an unwanted puppy. He was originally brought up from Arkansas in July by a local woman who thought he was going to be a small, lap sized dog. At 4 months he is already 15 pounds so he might be a 30-35 lb. dog, which was larger than she wanted. We expect he will be a medium-sized dog. He's not a big jumper and seems gentle with children, but is timid around toddlers. 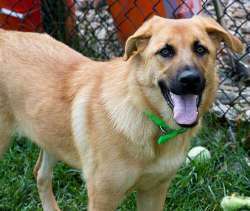 His foster mom says: He likes to play and will bark for my older dog to play with him. He likes to run around the yard and be chased. He loves to chew on an antler and to squeak the squeaky toys. He goes to bed around 10 and is good for the night. He gets up at 6 and does his business right away. He's just learned how to use the doggy door into the fenced in yard. This pup has a lot of personality and is extremely smart. He needs a stay at home situation, even if someone works out of the house as he will settle down after played with. Coming home for lunch would not be enough for him. Please apply online if you're interested as he's in a foster home and will need to be brought to the shelter to meet you. 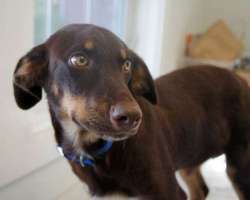 Tuggles is a really cute pup who is looking for his forever home. He is so cute and petite and adorable, whippet size but with the look of a Lab. He weighs approximately 12 lbs and he's 4 months old. He is the most independent and smartest of the litter. He can entertain himself and he was the first one to sit for treats. He is okay with taking his naps where ever and can often times be found doing his own thing away from the others. He is very loving, though. He's just curious. Tuggles, Rosie, and Sneakers are all siblings. He is available on or after 8/25. If you are interested, please apply via our online application so that we have it ready when you meet them at a Meet and Greet. Amber, Breeze, Katrina, Rocket, Shasta, and Vanna are gorgeous Golden Retriever mix pups. They are 4-5 months and they have the most amazing eyes. Vanna loves attention and weighs approximately 20 lbs. These beautiful pups are soon ready to be adopted. They crave attention as they have had to compete with each other their whole lives so far and are each ready for their own families. They would do best with someone who can spend as much time with them as possible and start the training they need. They have discovered air conditioning indoors lately and now they want to stay in all the time. they are submissive with other dogs and young enough to be trained around cats. They are available as of 9/4. Please help our Adoption team by filling out the online application so that we can have it ready when you come to one of our weekend Meet and Greets, I.e., shelter hours. We tend to show the dogs on Sat and Sun from 12-3. Walter is an adorable and very adoptable puppy. He's sweet and he's quiet. He weighs 24 lb and looks to have some Beagle and Collie in there. He is definitely a mix and is approximately 4 months old and is very loving. He loves to play and loves a good back scratch whenever possible. He has been in a house with lots of other dogs so is well socialized. He is passive and submissive. He was wonderful for the vet exam and even let us trim his nails. He is available on or after 8/25. Please fill out the online application as that will help to speed the process. William and his brother, Harry (you can change the name), are 13 week old puppies who came up from TN in search of a good home. They need stay-at-home situations where they can be properly socialized, loved, and trained. Please fill out our online application if you are interested in meeting either pup. KID TESTED AND GREAT!! Willy is a friendly male Beagle who is personality plus! He is a happy boy, is great with all ages of kids, and loves to play with toys. He is quiet in his crate and sleeps in it overnight with no problems. 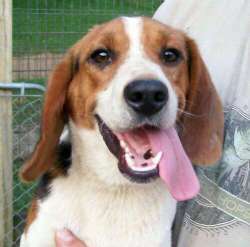 He's generally a joyful and playful Beagle boy who is nice and quiet. he only barks when he's excited. He needs a great home with someone who can play with him. He's an easy first dog for a family. Originally, he was found as a stray in WV. He came in along with his buddy, Wesley. 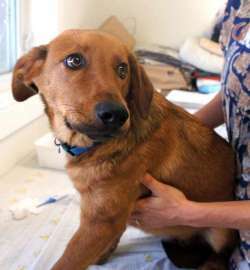 He had a bout of aspiration pneumonia following his neuter surgery, but he has recovered and is now ready for adoption. He's a very sweet and quiet Beagle, although as a young adolescent he is active and needs lots of play times and exercise. He has a beautiful coat with rich colors. A really handsome dog whose tail never stops wagging. Willy is a good boy, food motivated, and pretty easy going. He has a tiny bit of hair loss around his ears and eyes that looks like it was due to poor nutrition or he got into some briars on his travels. He's a very sweet and quiet Beagle. He is now available for adoption!